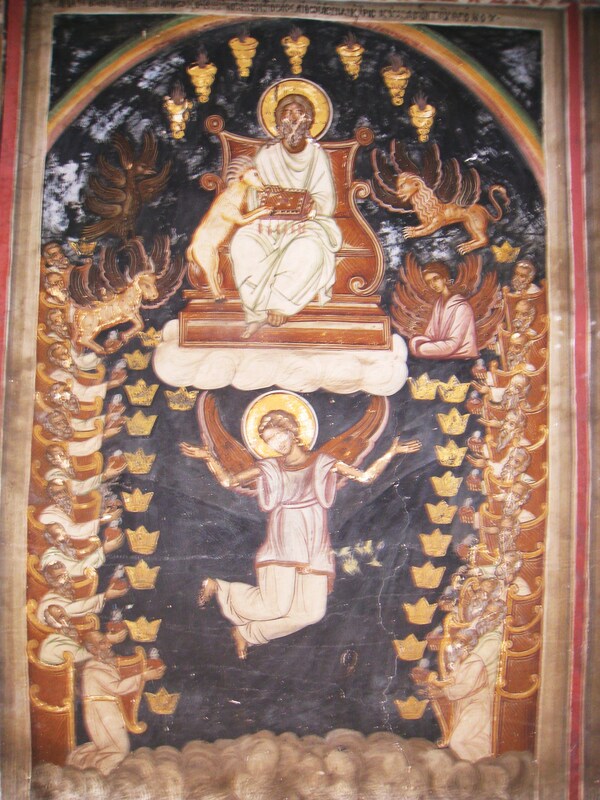 Today I will start with the 11th scene of the portico, showing the 12th chapter of the apocalypse of St. John. 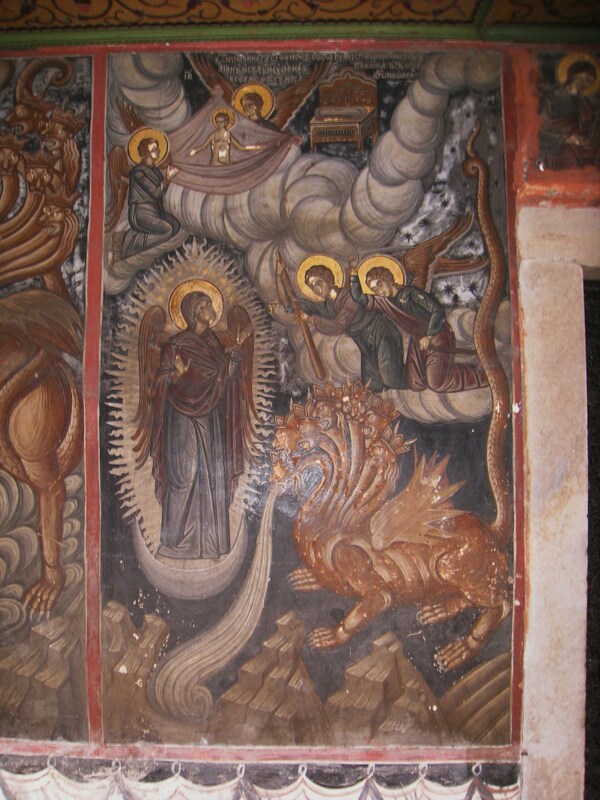 Left from the door leading to the refectory: “The vision of the woman clothed with the sun and of the great dragon her persecutor”. 12:1. And a great sign appeared in heaven: A woman clothed with the sun, and the moon under her feet, and on her head a crown of twelve stars. “A woman… The church of God. It may also, by allusion, be applied to our blessed Lady. The church is clothed with the sun, that is, with Christ: she hath the moon, that is, the changeable things of the world, under her feet: and the twelve stars with which she is crowned, are the twelve apostles: she is in labour and pain, whilst she brings forth her children, and Christ in them, in the midst of afflictions and persecutions”. 12:2. And being with child, she cried travailing in birth: and was in pain to be delivered. 12:3. And there was seen another sign in heaven. And behold a great red dragon, having seven heads and ten horns and on his heads seven diadems. 12:4. And his tail drew the third part of the stars of heaven and cast them to the earth. And the dragon stood before the woman who was ready to be delivered: that, when she should be delivered, he might devour her son. 12:5. And she brought forth a man child, who was to rule all nations with an iron rod. And her son was taken up to God and to his throne. 12:15. And the serpent cast out of his mouth, after the woman, water, as it were a river: that he might cause her to be carried away by the river. 12:16. And the earth helped the woman: and the earth opened her mouth and swallowed up the river which the dragon cast out of his mouth. Detail from the last scene: Michael fighting the dragon. 12:7. 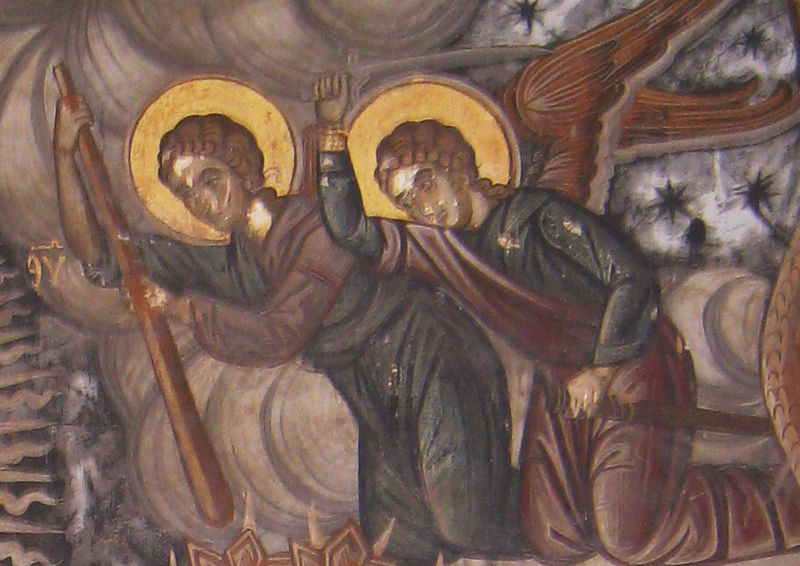 And there was a great battle in heaven: Michael and his angels fought with the dragon, and the dragon fought, and his angels. The next scene is situated on the right side of the door (see the red 4 on this plan). 10:1. And I saw another mighty angel come down from heaven, clothed with a cloud. And a rainbow was on his head: and his face, as the sun, and his feet as pillars of fire. It might be the “pillars of fire” we are seing, but I’m not quite sure, because the rainbow and on the head of the angel the sun is missing. The figure lookes more like a Christ Pantocrator than an angel. This last scene must be chapter 5: the strange lamb with seven horns and 24 ancients with 24 crowns, holding “golden vials full of odours”, but I also see the pillars of fire returning (see top), just as in the last painting from chapter 10, that are not mentioned in chapter 5. 5:6. And I saw: and behold in the midst of the throne and of the four living creatures and in the midst of the ancients, a Lamb standing, as it were slain, having seven horns and seven eyes: which are the seven Spirits of God, sent forth into all the earth. 5:7. And he came and took the book out of the right hand of him that sat on the throne. 5:8. And when he had opened the book, the four living creatures and the four and twenty ancients fell down before the Lamb, having every one of them harps and golden vials full of odours, which are the prayers of saints. This entry was posted in 05 Dionysiou, trip 2009: Wim's group. Bookmark the permalink.